What is mutual fund benchmark and how to choose mutual funds ? How would you judge whether you have scored good marks in an exam? How do you define “good”? If you had very very easy test and most of the questions were easy, would you call 80/100 a great score? NO! . In the same way, if the exam was very very tough and made everyone cry, but you scored 75/100. Would you call it a great score then? Yes! So the point I want to make is there’s always a benchmark in any area to decide if the performance was good or bad. If you have done better than the benchmark, you did well, else you did bad. This is exactly how mutual funds are to be judged. You can’t just say a mutual fund has performed bad or good based on the returns it has given in a time frame. Each and every mutual fund has a mandate and rule defined on where will it invest and in what proportion. Like if a mutual fund says that it will invest in all the large cap companies in India, then its benchmark would be mostly NIFTY, because NIFTY is the indicator of the large cap companies. And the whole point of investing in a large cap mutual fund is that it should give you better returns then NIFTY because you can always invest in NIFTY and get the returns without any fees or risk. So only if a large cap equity mutual fund beats NIFTY, you can say that it performed Good. Because if it does not then it has performed badly even after you paying him the fees, what’s the point of paying the fees and getting returns lesser than the Index which gives you some returns anyways. In the same way a Small Cap Mutual Fund would have CNX MID CAP. One can just buy that Index and get returns from it based on the movement of the stocks in that benchmark. A mutual funds tries to take a call on what stocks to select and when to get rid of them to generate superior results and only if it can beat its benchmark, we can say that the mutual fund performed better that it’s benchmark. So in any mutual fund, there is a benchmark and you can say that the mutual fund performed good or bad in a time frame only if the returns from mutual fund is better than its benchmark for that particular period. Now based on this very simple rule, lets see some cases. In the last few years, stock markets have performed badly. This bad performance from markets will obviously affect mutual funds performance too. So if a mutual fund has not given double digit returns, can we conclude that mutual funds are bad investments? No. I was told that HDFC Top 200 is an excellent fund . But I invested around 50,000 in that fund last year and now my fund value is near 46,000 . Is this fund really good ? This kind of questions come to all the investor’s mind, this happen when you dont know how exactly you should judge a mutual fund’s performance. The only way here to say is HDFC Top 200 did good or bad in last 1 yrs is to see if its return is more than its benchmark or less than its benchmark and to what extent? If you look at HDFC Top 200 returns in last 1 yrs from today (27th Apr 2012) , its return has been -9.8% . Now anyone hearing that kind of return will scream – “Oh .. thats really bad” . But when you look at its benchmark (which is BSE 200) , you can see that its benchmark has given around -12.06% So you can clearly see that HDFC Top 200 has outperformed its benchmark by 2.26% which means that it has done a better job. Note that mutual funds have stocks as the underlying assets in which they invest, so mutual funds performance will depend totally on stock markets performance and in last 5 yrs, its not mutual funds which have performed badly, its actually stock markets, Mutual funds just mimick the portfolio’s in some manner and the real parameter of how good or bad they have done is to see how they have performed compared to the risk-free benchmark they are following. Now coming back to the same example of HDFC Top 200 , it has given around 22.6% returns CAGR in last 3 yrs , but its benchmark (BSE 200) return was just 16.2% , hence you can say that HDFC Top 200 has done a good job and outperformed its benchmark by 6.2% on yearly basis, thats really a good number. If you look at its benchmark “Nifty”, it has given 24% positive return in the same period. Means that the fund has performed worse than the index which is totally free, while the fund has not performed even after bring run by professional fund managers. Then whats the use of that fund. Note that the duration should be good enough like more than 1 yr atleast to say anything and the gap between the fund performance and benchmark performance should also be considerable. You can say that a fund was bad just because its returns were 8% and benchmark was 7.8%. that is very much close and does not conclude much. Following is some of the very good potential mutual funds for 2012 and they are really doing good overall . Lets see their returns overall for 5 yr and 3 yr timeframe along with their benchmark returns. You can see some funds outperformed their benchmarks with huge margins . For example Quantum Long term equity fund has return 28.38% in 3 yrs compared to just 14.78% from its benchmark which is Sensex . Thats 100% more , really brilliant . So overall the learning is that if you want to find out some good performing mutual funds , you should be looking if a mutual fund has outperformed its benchmark over several years with a good enough margin or not . If it has consistently done that , you can be clear that the fund management is going well . How often do you look into benchmark ? What else do you think should be looked at while judging mutual funds ? I need to know how does compounding works in mutual fund. I understood the rupee cost average methodology which comes in picture when we use SIP method But compounding in mutual fund is something I couldn’t understand. Since the returns in mutual fund are not fixed how is the money compounded? Like in FD we know the interest rate would be 7.1% and at the end of the year the interest would be added to principal amount in the next year that is the way the money is compounded. Is it that at the year end if a said fund has a return of say 10%, they would buy extra units with that returns and add it to our portfolio? Your reply would be much appreciated. The compoundings does not mean that it happens each month or year. Compounding means the returns also gets returns, thats all .. So if your 1 lacs becomes 1.1 lacs in 1 month, then any further growth will happen to full 1.1 lacs not just 1 lacs, thats compounding ! First of all thanks for this forum…. its really educative. Total 6000 pm for 5 yrs. Plllll advice. I am already insured by govt and pension would follow. 1. Out of the total savings how much amount should be invested and in which asset classes. 2. I already have a SIP, now instead of a FD or a recurring deposit, can I make investment in a Mutual Fund and as and when I have some surplus amount, can I make further investment in that same folio or will I have to make another investment in a new fund. I would also like to know that while applying for a new term policy, when giving details of existing insurance policies, I have to provide detils of the policies which are paid up for which I am not paying premium as well? Also last year I applied for a term policy with aviva for which my premium was increased because of some health issues for which i refused the policy and later i purchased a policy from kotak in which all my health report was correct. Now while applying for the new policy, do i need to give details of the aviva policy as well which i refused? I am applying for bharti axa online term plan. There is a column of insurance history with other companies, where it is written to provide details of existing life insurance cover with other companies. 2. You can invest in the same Folio , its possible . Manish, this is a really good article. I have been investing in mutual funds since 2006 and I have always relied on the MF ratings provided by ValueResearch & MoneyControl to decide on which MF to invest. Only now, after 6 yrs of investing in MFs, I’m starting to understand (some of) the science behind the valuation. Thanks for this! Do you have a similar article on how to evaluate ULIPs? I’m not sure which benchmark can be used as its a mixed investment (insurance + markets). Should I evaluate based on IRR (sum of cash outflows + current value), or is there a better way to evaluate the return? You cant benchmark ULIP’s as there is no standard format and no clairty on where they invest exactly . I would personally skip them altogether ! Thanks for the useful insights on the topic. Can you please tell me how do I get this data of the Benchmark performance and MF performance.? There are various websites from where you can get it like moneycontrol.com or valueresearchonline.com . 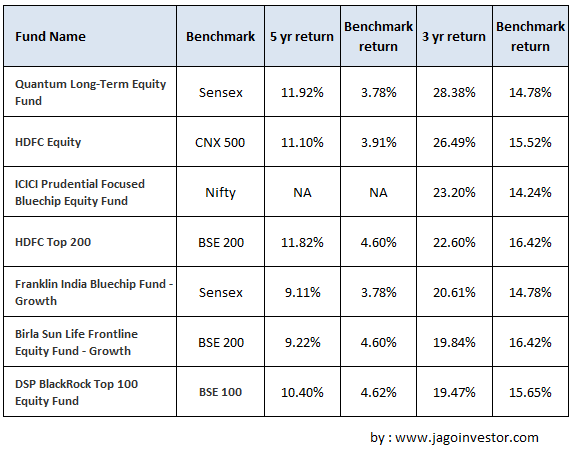 How 3yr return is more than the 5yr return in both Fund performance and in Benchmark. I mean to say in the Image Quantam has 5yr return as 11.92% and 3yr return as 28.38 also benchmark is 3.78 % , 14.78% respectively . Is it that the market didn’t perform well in the last 5year and it performed well in last 3yr . Now what about 5-3=2 . So in between this 2yr how did the market performed.??? Why cant it happen . It can happen that in last 3 yrs performance was good , but overall 5 yrs was not that great ! instead of CNX MID CAP it would be CNX Smallcap . CNX Smallcap Index is designed to reflect the behaviour and performance of the small capitalised segment of the financial market . Manish SIR Kindly reply . Article says, “example of HDFC Top 200 , it has given around 22.6% returns CAGR in 3 years” but on http://www.moncontrol.com (good source says) it is merely 8% and in last 2 years it is -1.3%? How 22.6% number you came to? Its 2.26% , not 22.6! You see, Manish: I have purchased ICICI pru focussed Bluechip in 2008 for Rs.20,000/- at NAV Rs.10.23. Now the value of Rs.20,000/-(allocated units 1955.990) fund has grown up to Rs.31,800/-NAV as on 30.6.2012 was 16.26. So what is the return of Rs.20,000/- to me? 100 x 11000/20000 x 4 = 13.75%. Here, 4 years is the period of investment. 11000 is the value by which investment has grown up. Thus, I say that I have got return@13.75%. Do you agree with rational and method? I am glad you have brought in this sensitive and very much critical point of view for those who know not how to satisfy themselves about their investment as a whole. The Benchmark is common and reference point on the basis of which whatever we do has to be weighed. But for a common man what matters is the absolute return and not relative return with reference to NIFTY or BSE index. When MF and Stock returns are reported by various Newspapers / Bulletins / websites, are these returns wrf to Index or are these absolute wrf to NAV of X date to NAV of Y date? Secondly, of these two methods, there is another method which I use for my simplicity. I take the purchase value as base and NAV value as variable and calculate percentage difference and say that this is return I have gathered. This calculation is like Bankers’ interest calculator. I find it more rational and satisfying to me because I have my own benchmark i.e investment value with which I must compare my returns. what do you think? Can you explain with example your method ? What is your opinion about Reliance Growth , I am invested since last two years but its performance is not so good as compare to other funds like IDFC Premier equity, HDFC Top 200, DSP Black Rock Top 100. I am new to financial planning . I am extremely impressed by some of the articles in this site jagoinvestor. Some of them have been extremely useful to us. Thanks for ths same.Also appreciate the prompt response in your site. I am new to Mutual funds and am looking forward to investing in them. Is there any beginner’s guide on how to read mutual funds performance and how to choose what to invest on. Also is SIP better or one shot investment is good. I am also not familiar with termniologies like small cap,medium cap etc. I think i have made a mistake by investing in ICICI prulife lifestage RP. I have paid 3yrs premium of 30000Rs every year and i have an outstanding due of 30000Rs for next month ( 4th Yr) currently my fund value is 70000Rs (90k invested till now) the fund is currently 60% equity and 40% debt.. I raised a call with ICICI prulife they informed i will get 96% of the fund value after 5yrs its 100%.. Please advice if i need to continue to invest or shall i make it to debt fundor shall i break and come of this fund with 96% and invest the money elsewhere. need ur advice…..shud i go with this? I do not know the background hence I can not comment , the financial advisor might have suggested it as per your situation and requirements . Kindly suggest your views on below mentioned funds; As I want to invest with equity oriented plans, I have shorted out some fund. I want to choose any 2-3 out of 9 funds. You should choose just 3-4 funds maximum . from where have you listed these down ? And on what basis ? I want to invest only in 2-3 funds from above. I have found out funds as i think person should invest in emerging fields thats why i have sorted out SBI emerging business MF, DSP micro cap MF, DSP nat. resources and new energy fund. I just want to start with 500 rs SIP.I have already started HDFC Top 200 G. In debt portion, I am investing in bank FD and PPF. I just wanted to invest in small/micro cap companies that why I have selected above ones. Thanks Manish. Fund is doing better than the BSE Power index. Then its doing good i would way ! I do follow your posts when ever i find time. You bring in some of the basics which we tend to forget due to xyz reasons. In this article, i would define performance in two ways – a.before i select to invest b.after i invest. Before invest – I would consider your way/kind of percentile calculation(termed as benchmarking – which might differ by few small number considering some comments raised by followers on dividents) to choose it. After investing – I would rather look at the percentage of return i get. I will not be happy stating that my funds are doing better than its benchmarks, when both are in negative. In that case I would say you still have not got the point that if a fund has given a negative return, still it can be a great performance . Beating the benchmark shows that the fund has done what it was bought for . Truely speaking if you look in deep, you buy a mutual fund to beat its benchmark , nothing else .. else you can just buy an index fund . My Son Rohan is now 2 yrs old…. A.I.- Upto 3 Lac Son- 2 Yrs …….. I want to Invest Rs 7000 PM…. in mutual fund through SIP…..
## ICICI FOCUSED BLUECHIP- 1000 PM Since 2011…. plz make my portfolio better…. Isn’t the 1 year return of benchmark better than HDFC top 200 ? HDFC top 200 1 yr return 9.8% and benchmark 12.06% .. So bench mark has outperformed the HDFC top 200 by 2.26 but you have written that HDFC Top 200 has outperformed its benchmark by 2.26%. I’ve copied below lines from above post for your refernce. If you look at HDFC Top 200 returns in last 1 yrs from today (27th Apr 2012) , its return has been -9.8But when you look at its benchmark (which is BSE 200) , you can see that its benchmark has given around -12.06% So you can clearly see that HDFC Top 200 has outperformed its benchmark by 2.26% which means that it has done a better job. The benchmark used by mutual funds are usually price only indices like NIFTY which doesn’t account for dividend incomes.. this is misleading. As Mutual Funds account for dividend income also in their own performance, they should show total return indices as their benchmark, not price only indices..
NSE website also provides total return index value for nifty 50. But no one mention that as benchmark, so that their active performance remains inflated. Thats a good point ,Do you know any source where we can get correct data in that case ? You can check any MF performance report, and compare that benchmark return with actual NIFTY(Price only as well as Total returns) from NSE website. You will be able to find out that benchmark shown usually would be price only one. Right now I have started investing 500/month in HDFC top 200 and i want to invest in other 2 funds. Can you suggest me? I am investing in HDFC TOP 200 since November 2010 through SIP. Even though i utilized the opportunity of lumsum adding during market fall. I invested 10K during fall . So whats the matter if FUND is showing positive return but you can be still in negative holding? Asusual,Thanks for the good article. It is informative. As you suggested in other comments, i went and verify the moneysights.com for ICICI Prudential “LifeTimeSuper-Flexi Growth”. I could not able to find or i am not searching in a right way. Do you think this one is going good right now? Guide me. does this benchmarking do not apply on ULIP? What about ULIPs? Dont we have benchmarks for these things? How can we evaluate whether this is going in right direction or not? i haven’t thought on this before.. Thanks Manish for writing up this article.. It would definitely help in future.. as i have 1 MF from ICICI bank.. its not even 1 yr old.. So can;t judge.. Lets see what happens next.. I am planning to continue this for atleast 15 yrs. Later I would move the lumpsum to a good Balanced fund(like HDFC Prudence) or Gold ETF for much safer ride..
Do you think the approach is right? Do you think that above investments will give me better returns than FDs/PPF or other govt funds in 15 yrs timeframe considering market crash, recession etc eventually. what do i do for my child education??? plz suggest me some excellent fund…..to get this goal…..
is following funds gud to invest ??? YEs .. these are some good funds .. to start with go with these funds ! What you think about my following SIP….???? I m looking for my son (1.6 yrs) education…. for 15 to 18 yrs…. how much money i should invest to get min 30 lac & max. no limit…. Actually u can do anything .. both should be ok … the main idea is to see that over a long term period it has done good . Using any of what you mentioned should work ! One important metric I use is to see who the fund manager is and how long has he been associated with the fund. After all, a mutual fund doesn’t manage my money, the fund manager (who can be an eccentric individual) does. So the past track record of the fund combined with whether it has been managed by the same fund manager for a long time (across market cycles) is what I look for. Yes .. thats really something important to look at . What you think about Reliance Regular Savings Fund? I have SIP of 2000 PM in this fund. Should I continue with it? Usually, I compare funds with its Catergory Performance which is readily available. You are doing a right thing , however this additional step will check the fund performance against its benchmark which I think is more important . Its like you want to marry a girl , and that girl is better than other 2-3 girls you have seen till now . But how do you know that she is right one ? She should pass the criteria which is minimum fit for you ? Thats benchmark ! Is there any website to check the benchmark performance of funds… All these sounds greek and latin to me!! I invested in Mutual fund for the past 3 years and clean wiped it recently to invest on property!! I did the investment based on my father’s friend recommendation… But now I want to do it on my own, afterall it’s all hard earned money and I would like to know clearly what is going on when I invest..
very good article Manish..I got one question after reading this, I have a demat account with ICICI Direct, and I dont see a option to buy INDEX, could you help me as How can I buy INDEX (Nifty or Sensex) for longer term. what are best options for short term investments (6-9 months)? I have seen most of all liquid funds hadnt given more than 6% return in 6-9 moths. I am planning to buy Kotak capitalmultiplier. Is it better one? Around 25000 rs is to be filled for 15 yrs per annum and i will get 4 to 5 lac sum assured at 15 yrs, 4-5 lac life insurance during 15 yrs and i will also get 50000 rs every yr thereafter for next 15 yrs. Manish, I think the most important benchmark for comparing a MF or for that matter any financial product is the rate of interest used in calculating the goal for which you invest and rate of inflation used. As long as the fund is performing comfortably above these numbers, it really shouldn’t matter if the fund is 3* or 5*. If this happens for most years (there will be years like the last one! when every fund equity diversified fund had negative returns) it should be okay. What I find quite disconcerting is even financial planners when they dole out advice in blog are always after more returns, more alpha etc. In the name of financial literacy people tend to over think their investments constantly worrying about top performers. A sense of contentment is important while investing. Yes Pattu , you are looking it from goal planning point of view . While this article just talks about given a group of mutual funds how do you say if a particular mutual fund performed “good” or “bad” in general . Its on absolute level . While you are talking from “metting expectations point of view” .You can expect just 8% and in that case a fund will be “good” , but if someone else has expectation of 15% , then it would be bad. so its very much dependent on a person thinking, while we are talking about a universal way of looking at it irrespective of how people look at it on personal basis. I hope you get my point ? I understand. Given 3 funds bench marked against the same index an investor should not worry about which is giving more returns as long as each of them outperform the goal planning parameters. In many cases it is easy to find 3-5 fund which do. My point is I find even financial planners dont adhere to this. Perhaps they are worried about losing clients and perhaps because most investing is not done with goals in mind. But as an investor, I should not worry about how well is the index performing, the Fund Manager should be good enough to select the stocks to provide more returns to investors. Index is not performing well does not mean all the companies are not doing well. During this period the fund’s portfolio can be adjusted to move funds from worst to worse and worse to bad for maintaining better absolute returns. I think this is how the funds in your example are outperforming the benchmarks. There is a notion in the market that MFs are very economical one as they do not charge the entry and exit fee. As, it is the matter of fact that there are no free lunches in this market. MFs do charge but the entire charges are spread over the period and at the same time to understand the MFs’ charges is not to the everybody’s understanding. It would be good if you can write something on the charges of MFs. Secondly, there are other things very crucial for understanding the MFs real picture in the fact card like, churn ratio, expense ratio, cash in hand, peer returns ect. Capsules on these topics will certainly enlight the readers for taking an informed decision. As most of the time MFs are purchased on sheer recommandations of friends, relatives, peers or agent. Do you think we should compare it to AAA Bond Yield??? Compare WHAT with AAA bond ? i am reading jago investor from last 2 months. you are really helping to solve financial issues. my husband is going to purchase a insurance policy (birla sunlife forsight plan gauranteed option http://insurance.birlasunlife.com/ProductsSolutions/IndividualSolutions/WealthwithProtectionSolutions/BSLIForesightPlan/tabid/427/Default.aspx) for better return. we already have a term insurance plan HDFC click 2 protect. now please suggest me that we should go with this plan or we should go with sip (mutual funds) ? would you advice going for a sip on a weekly basis or fort-nightly or monthly basis.. since the fluctations are more.. we can average well if its for a short duration..whats your say.. While there may be some element of truth to it , however dont take it as filtering criteria . A big fund has its own advantage and especially Top 200 is in good hands (Prashant Jain) .. There is no statistical proof why big funds should do bad compared to smaller one’s ..
After reading your blog about the need for financial planing, I have hired a CFP and he is well-informed. I am doing a SIP os hdfc top 200 till today, when checked his opinion about the same, he is of the view that HDFC Top 200 fund’s expense ratio is more when considering the AUM they have. AUM should be less with such a large AUM number and he asked me to switch can robecoo equity fund whose expense ratio vs AUM ratio is better compared to Top 200. And considering other factors like std. deviation, alpha, beta..
Yea .. I thikn that makes sense ..
How do you decide which benchmark – Nifty, Sensex etc to chose for any particular MF? Its actually very clear because of the mandate of the fund , If a fund wants to invest 50% in large cap and 50% in medium level companies , but wants to make sure it can invest in top 500 companies , then its the index which mimics this is BSE 500 , so clearly it will be the benchmark . Thanks Manish. Is there any place I can find list of all benchmark indexes in India? I was exactly looking for this info as I often struggle to find what is the right benchmark for my fund. I found moneysights.com is no more available. Is there any place from where we can find this info? I suggest you look at livemint and morningstar websites too ! Good article; boosts the investor confidence in MFs. Some days ago you had written about banking ombudsman and a person getting 100rs per day as compensation. Is the same applicable to LIC? We surrendered an endowment policy 2 months ago and they said march is yr end, so the money will come in april 1st week and now it’s may 1st week, still we have not received money. It’s not a small amount and it’s affecting us. What can be done to get the money along with compensation? I think you should escalate the matter to IRDA. I also surrendered my policies some 15 days back and have got the money now. You have to follow up many number of times and keep calling at their where you submitted the policy documents along with surrender form. Yes they are slow etc etc, but if you keep following, it should be done. Because of speedy process and hassle free repayment options. Nice write up. Simple and to the point! timely disbursement of loan will beat inflation & price rising, irrespective of charging interest rate.